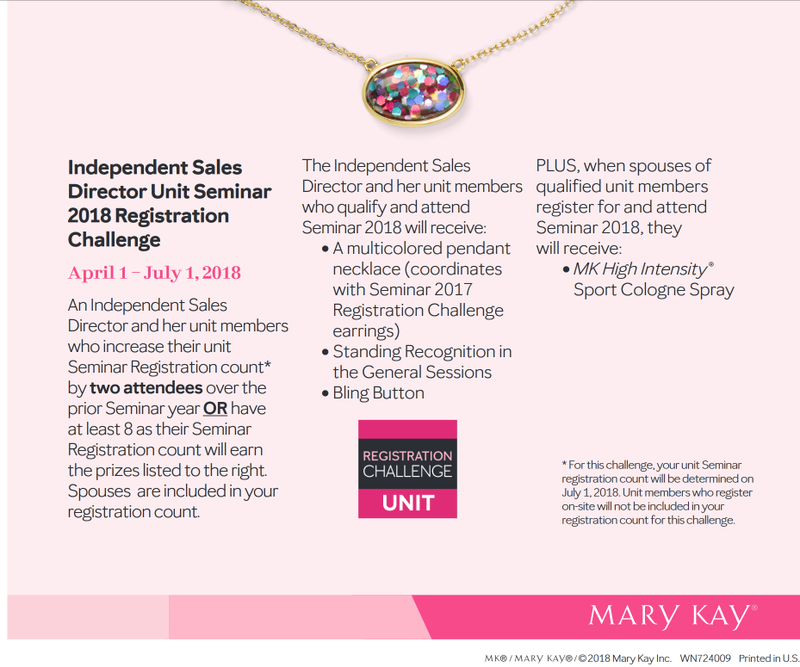 I always complain about how Mary Kay rewards ordering over selling… paying commissions and giving prizes based on wholesale orders by consultants. They don’t give a darn if anyone ever sells those products, so long as MK has their money in hand. Now they’re rewarding Seminar attendance. Attendance! Doing nothing other than showing up for Seminar. 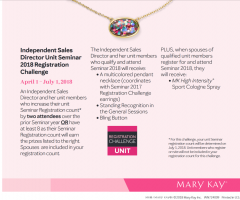 If a director has 2 more Seminar attendees than last year, or at least 8 in total, she gets a piece of fake jewelry, standing recognition, and a “Bling Button.” Spouses even count toward registration numbers! Thanks to BestDecision for finding this one! I know you’ll just delete this but that’s really smart of MK. Higher attendance creates higher energy. Higher energy creates more enthusiasm. Added enthusiasm generates more action. More action leads to higher sales. Higher sales gerenates additional income and profits. If you weren’t so materialistic you wouldn’t care that’s it’s inexpensive jewelry but rather a token showing appreciation for participation . By the way… I get compliments regularly on the High Intensity cologne for men. Can’t wait to get my free bottle when I stand next to my wife at the next conference. Have fun being a dream crusher… You’ve really found your place in life. Kudos to you. Hi Tony – Still stalking us, I see? You’re absolutely right. MK is all about the profits for themselves, and that’s what this is about. They give out a “gift” that costs them about 25 cents. In return they have higher attendance, and they know the statistics regarding orders. Those who attend seminar are much more likely to order, and in larger amounts. The consultants don’t actually have a greater chance of SELLING those products, but MK doesn’t care, because they already have their money. Tony sounds like a bigger troll than me…at least I make people laugh…Tony just sounds sad. If higher attendance generates higher energy, enthusiasm, action, sales, yadayada, WHAT WENT WRONG at the 50th anniversary Seminar? Oh that’s right… it was overfilled with less-than-committed curious gawkers who were never expected to succeed anyway. There’s always an excuse for everything. If sales really were high, you’d need not motivate them to go anywhere. Tony, I was a Director with offspring Directors, sat in countless meetings and focus groups where this very topic was continuous. No one ever wanted to admit or face what the real problem with low attendance was. Please. You’re way off base. Only for the MLM company … not the attendees. Seminar is like the “Two Minutes Hate” in 1984. It refreshes the brainwashing and diverts attention from the real misery onto other targets. You can black out the name and SS#. We’ll wait…. Seriously. Zoom in on the photo. Confetti. What did they do? Raid the kids section on an Arts and Crafts website? Con$idering how$ much$ Extra$ Money$$$ they’re getting in registration fees, it would cost MK very little to upgrade that ornament to a plastic faux opal. But nnnooo. MKC has to go Bottom of the Barrel cheap and hand out confetti charms. Now doesn’t that make you and your husband feel special? Mmmmm? It’s from kate spade. They gave out the matching earrings last year which were also kate spade. All the jewelry given at events such as seminar and leadership for the past couple of years has been kate spade. Not the rings and all that but the gifts for attending. Also the star consultant prizes are alot of kate spade. Ugly name brand junk is still just ugly junk. Kate Spade makes a lot of pseudo-designer artsy claptrap. Just look at the line of Kate Spade cell phone covers. You could hang a flashing neon Kate Spade label on that necklace. It still wouldn’t impress anyone or improve the quality. Junk will always be junk. It’s interesting that this flyer doesn’t mention that they’re Kate Spade. I’m thinking MK has shopped at a vendor tent and found a lookalike. It’ll turn green within months. It may be Kate Spade branded, but it’s still junk jewelry, and not the real thing. I can make that necklace myself with a blank bauble from Michael’s, a glue gun and some confetti. They’re not even pretending anymore. This is seriously the ugliest necklace i’ve ever seen. Most of the jewelry i see come out of MK looks like… i woudln’t call it gum ball machine, but i’d call it, like, “kids costume jewelry”. This? it looks like something you WOULD find in a gumball machine at the grocery store. It legit looks like something i’d give my kid to play with for dress up. At best. Heck, i’m pretty sure, my 5 year old daughter who is kind of a fashionista would wave her hands at it and go “NO”. Its kate spade costume jewelry. It would appear that Tony has been drinking too much of his wife’s Kool-Aid understand how deeply in debt their household must be!!!!! By the time the two of them come out of it it could be disastrous !!! An obvious rip-off of the popular Kendra Scott-style jewelry. I don’t think Kendra has anything to worry about. And even if he did provide a Schedule C showing a profit, that would prove she was a shyster willing to double charge friends and family for products, inventory load, or actively recruiting willing victims by embellishing and telling porkie pies. It’s ALL bad. In case anyone can’t make it to seminar this year but still wants the jewelry, just let me know. I’ve got a glitter wand and a coupon to hobby lobby. I was in MK for all of 5 or so months and quickly realized the prizes are a hoax. All of them are cheap. Then many are branded Mary Kay. I mean who wants a cheap purse that says MK or Mary Kay on the front? Not only that but what must be done to earn the prizes is disproportionate to the value of the prize. Spend air fare, hotel, registration, food, incidentals, etc. to get a $1 necklace or $5 cologne? Think about it. Not worth it. Absolutely right that the stuff costs MK next to nothin. During my time in MK I attendended Career Conference. The cost of the hotel and gas and parking and food and taxis and new outfits and the driving 3 hours and wear and tear was so not worth it. MK knows that folks can’t or don’t cost/benefit analyze their attendance to their events, so adding an incentive with a perceived value will boost their profit on registrations and increase sales. Very cunning. Awww I remember when the Kate Spade confetti earrings were all the rage a couple of years ago. Sweet memories….anyways. I wanted a pair but I wasn’t about to drop the cash for such nor was I willing to sell my soul. Ahem….Mary Kay. Whatever. So I went to Walmart, bought some black “gemstone” looking studs, confetti nail polish and clear nail polish and after a grand total of $8 and 20 min, I had my very own pair of confetti studs. Wore them a couple of times, got some compliments. And the best part??? Not one single bit consisted of me having anything to do with Mary Kay. Moral of the story? You can get what you want on your own without having to sell out to Mary Kay. Those earrings/that necklace are not worth the insane amounts of money you’d have to drop on your MK business to perhaps receive a pair. And that cologne stinks. If that’s your gig, then do you. But it still stinks. My husband would think I hated him if I gave that to him.